A client is the part of the system on which the verinice client runs. In the operating mode Standalone the system environment consists only of this client. In the operating mode Server the client must be connected to a verinice server. If deployed in the operating mode Server the vDesigner can be run on the client and the webfrontend in the web browser. Using the vDesigner report templates can be edited. In the operating mode Server there are usually multiple clients in the system environment, all of which are connected to a server. This section contains the recommended and minimum hardware requirements for the client. The verinice client is platform-independent and works on different operating systems. This section describes the operating systems on which the client runs. verinice also runs on other versions of Microsoft Windows. However verinice is not tested by SerNet on these versions. verinice also runs on other versions of OS X. However, verinice is not tested by SerNet on these versions. verinice also runs on other Linux distributions and versions, eg. CentOS. However, that's not tested extensively by SerNet. 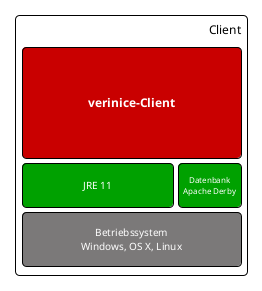 The verinice client and the vDesigner only work together with a Java Runtime Environment (JRE). The verinice client comes bundled with JRE 8. In the operating mode Standalone the verinice client stores all data in a local database that is bundled with the client. The database used here is Apache Derby. It is not possible to use another database on the client. In the operating mode Server no database will be used on the client. The web frontend also works in other browsers. However, they're not tested by SerNet. This section contains the recommended and minimum hardware requirements for the server. The recommended requirements are sufficient for an average system environment (small and medium enterprises / SME or individual organizations). If an above-average number of verinice clients is connected to the server or an above-average number of data is stored on the server, then the requirements are higher (data center operations for multiple clients or corporations). Operating system for the verinice server is either CentOS or Red Hat Enterprise Linux. Standardized operating environment for the server is the virtual verinice.PRO appliance pre-configured by SerNet. The verinice.PRO appliance is based on CentOS 7. Starting with version 1.16 verinice.PRO can be installed on CentOS/RHEL 7 and CentOS/RHEL 6. 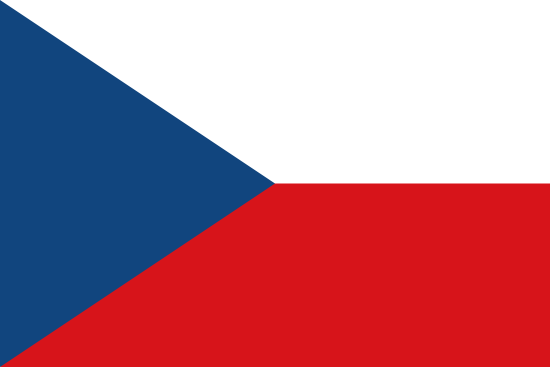 The verinice.TEAM will announce in time when it will release verinice.PRO packages only for CentOS 7. We expect to discontinue support for CentOS 6 in the 4th quarter of 2019. When installing the appliance verinice.PRO as VMWare Solution: VMWare ESXi 5.1, VMware Fusion starting with version 5.x and VirtualBox 4.3. The verinice.PRO appliance can be deployed in other virtualization environments – hoewever this is not tested by SerNet. The verinice server is only functional with the Java Development Kit (JDK) 8. The Java 1.8.0-openjdk package from the CentOS or Red Hat Enterprise Linux repository is necessary. The verinice server runs as an application on an Apache Tomcat 6 or 7 application server. It uses the package tomcat6 from the CentOS or Red Hat Enterprise Linux repository. The verinice server also works fine with other application servers – however this is not tested by SerNet. The verinice server requires a database to operate as intended. Data input from the verinice clients connected to the server is stored in this database. If Oracle is selected it runs on an external database server. It is possible to use a pre-existing Oracle server which is also used for other applications in the company. PostgreSQL runs on the same host as the verinice server. verinice is more efficient when PostgreSQL is used. That's why the verinice.PRO appliance includes PostgreSQL. The verinice server also works fine with other versions of PostgreSQL and Oracle – however this is not tested by SerNet. The verinice server is reachable from the outside via the web server Apache 2.2. To enable this the Apache httpd package from the CentOS or Red Hat Enterprise Linux repository is used.